We cruised on Celebrity Millenium 10+ years ago and still remember the outstanding experience. We anticipated the same high quality service level and entertainment existed today, alas not. The nightly shows in the theater were fair -- the ship&apos;s cast of singers (Broken Strings show) and show guests (We3Vocal, Divalution (Lauren Tidbit was the only good singer), Gid Pool). The ship&apos;s cast was energetic and the aerial acrobatics were amazing. Unfortunately, the singing was fair. Dominick Allen&apos;s singing was horrible - out of tune, pitchy, flat. The best show/guest was comedian Ed Regine. Phil Lewis as Phil Collins was stellar as was Ben Mills. The podium talks in the mornings were a treat, especially Melinda Bates. The matinee shows during the day is a good offering but were really no better than the show from the previous night. The house band was superb! Late night shows (Frisk Feud, Liar&apos;s Club) were excellent! Other singers and acts throughout the ship (Take 5) were good. A dietary restriction (dairy allergy) existed in our party which was communicated to staff at Lawn Club, Blu and Ocean Cafe (buffet) the first time dining in each. Since we ate at Lawn Club for dinner the first night, the individual made a note in our account (no dairy or garlic). However, that notation was not viewed by staff at Blu as we had to re-tell them again. Due to Celebrity staff&apos;s miscommunication of pre-ordering lunch, some lunchtime meals were not served or took an extended amount of time (20-45 minutes, the latter being on 11/01/2018 when the lunch order was simply cooked fish on a bed of salad greens). I even inquired a second time on the status of lunch and staff replied "it&apos;s coming." Lunch this day was delivered 45 minutes after initial check-in at Ocean Cafe. Celebrity Staff apologized for the mishap while patiently waiting in Ocean Cafe. It took 4 days for things to be worked out whereupon lunch service improved - took 4 days for a process to be defined which we strictly followed going forward. Fortunately, no further mishaps occurred requiring the need to speak with a ship&apos;s officer. Both Chef Raynold and Pastry Chef Sherin are excellent, especially preparing dairy-free meals and deserts. When ordering a specialty dinner package at Murano, upon going to Lawn Club to book a dinner for later in the sailing, it could not be found. Fortunately we were not charged extra. It was frustrating internal systems are not talking to each other or updating timely. Food on the boat was tasty for every meal eaten on board. While Blu offered light entrees at dinner, Aqua Spa Cafe offered light dishes at lunch. The salad and soba noodles were excellent! Sushi was great! It was a treat to experience Taj X one night at Sushi on 5. Since this was an Indian cuisine experience, Indian Beer should have been offered. Activities were posted in the daily itinerary and on a board at Guest Relations. Because each method draws its own audience, all daily items posted on the board at Guest Relations should have also been included in the daily agenda. As a participant, the LGBTQ social was moved two times without notice. This was confirmed because I took a photo as a reminder of the location (Martini Bar) and time the first day, only to see a different location (World Class Bar) when checking the board again. This was only discovered checking the board at Guest Relations at different times - not until Day 12 was the social published in the agenda. Posting all activities (for that day or daily occurrence) in the agenda all staterooms receive is best. On a related note, a small World Class Bar sign exists on the wall at the bar, but there is no World Class Bar listing on any board in hallways or outside an elevator bank(s). I had to ask Guest Relations two times for the location because I bypassed it for two days. We enjoyed activities offered on board (Nacho&apos;s dance classes in the morning, pool volleyball (guests vs. guests, guests vs. crew), Thriller dance class, Apple device classes/tutorials, cooking demonstrations). The Thriller dance class was fun to prepare for Halloween night. The foyer staircase and Ocean Cafe were decorated nicely and guests were encouraged to dress up. A costume parade would have been even better - start at Opus, walk to Reflection Theater, go down one floor, then end at Grand Foyer. DJ Gio played good tunes and mixes at the martini bar in the evenings and the bartenders at martini bar were animated making drinks, especially the evening of pouring several martinis from several shakers at one time. Some assistant/waiters in Blu were very attentive to us. The ship was elegant, clean, and well maintained. The glass elevators were very cool in the center portion of the ship. We spent a lot of time on the pool deck and in the solarium. I remember the Millenium&apos;s Solarium pool had metal bars in the pool for guests to sit/lean on - that was missing from this pool. The stateroom was always made up nicely by Wardan. He kept our quarters clean and tidy. He was attentive to our needs and personable when passing him in the hallway. Instead of Do Not Disturb signs, which easily fall off door handles, the rotating dial outside the stateroom telling the stateroom attendant service needed would have been better: Do Not Disturb, Make Up Cabin, Turn Down. A pleasant surprise was the light in the stateroom&apos;s bathroom did not fully turn off, but became a night-light. That was great - for those of us who get up in the middle of the night. The Captain was the best. He participated in the late night show Liar&apos;s Club. His daily morning announcements were hilarious and he met with guests while in public. Definitely a star! Went to Sky Lounge for Bandioke -- this was very clever and fortunately had a good turnout and guest singers. It was this night I attempted to order a Virgo drink from the lounge menu. The bartender told me the bar was out of some ingredients and could not make it. At World Class Bar another night, I ordered Strawberry Fields from this bar&apos;s menu. Bartender advised the drink is no longer made with egg white because of guest&apos;s intolerance, yet the menu clearly listed his ingredient, a reason I wanted to try this drink. For guests like us who did not purchase the drink package, Celebrity lost revenue. These mishaps deteriorate our experience on the Reflection and with Celebrity Cruises. We booked Aqua Class to experience light dining and hoped service level in the dining room would be more attentive. Consistently, this was not the case. It took 2 days for restaurant Maitre&apos;D and Assistant Maitre&apos;D to open up to us (they were so focused on the job and not guest experience) which left a bad first impression. Fortunately, as cruise went on, they became more personable and conversational. Staff were busy serving and clearing tables, but consistently we observed inefficiencies. 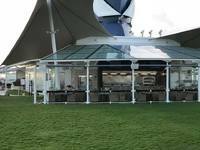 At Blu and restaurants throughout the ship (Lawn Club, Tuscan), food would be delivered to our table correctly, but placed in front of the wrong person. This boat was understaffed (on 10/31/2018 at Ocean Cafe, took 20 minutes for tables at 2-3pm to be cleared by staff on the back deck, on 11/01/2018 while eating dinner at Tuscan service was very slow - had to request water glasses be filled twice and the wine order took 10 minutes to arrive at the table) and under-trained. 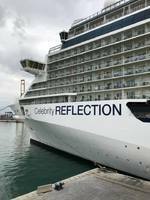 We heard from guests and staff throughout the cruise, many staff were pulled off Reflection to prepare for Celebrity Edge - this showed and certainly contributed to our less than highly satisfied experience. Quality was not the same as prior Celebrity Cruise. As experienced mariners with NCL Cruises, we truly had high hopes for Celebrity to deliver in all areas. We have even stayed in NCL&apos;s Haven class (on mega-ships - MS Escape) and felt Celebrity&apos;s Aqua Class would offer equivalent food and service levels. Unfortunately that was not the case. Consistently, service performance on this Celebrity cruise under-performed. With Celebrity striving to provide the best vacation possible, it fell short. While the cruise was enjoyable, no positive changes were made in our lives as guests. We cruised on Celebrity Millenium 10+ years ago and still remember the outstanding experience. We anticipated the same high quality service level and entertainment existed today, alas not. The nightly shows in the theater were fair -- the ship&apos;s cast of singers (Broken Strings show) and show guests (We3Vocal, Divalution (Lauren Tidbit was the only good singer), Gid Pool). The ship&apos;s cast was energetic and the aerial acrobatics were amazing. Unfortunately, the singing was fair. Dominick Allen&apos;s singing was horrible - out of tune, pitchy, flat. The best show/guest was comedian Ed Regine. Phil Lewis as Phil Collins was stellar as was Ben Mills. The podium talks in the mornings were a treat, especially Melinda Bates. The matinee shows during the day is a good offering but were really no better than the show from the previous night. The house band was superb! Late night shows (Frisk Feud, Liar&apos;s Club) were excellent! Other singers and acts throughout the ship (Take 5) were good. A dietary restriction (dairy allergy) existed in our party which was communicated to staff at Lawn Club, Blu and Ocean Cafe (buffet) the first time dining in each. Since we ate at Lawn Club for dinner the first night, the individual made a note in our account (no dairy or garlic). However, that notation was not viewed by staff at Blu as we had to re-tell them again. Due to Celebrity staff&apos;s miscommunication of pre-ordering lunch, some lunchtime meals were not served or took an extended amount of time (20-45 minutes, the latter being on 11/01/2018 when the lunch order was simply cooked fish on a bed of salad greens). I even inquired a second time on the status of lunch and staff replied "it&apos;s coming." Lunch this day was delivered 45 minutes after initial check-in at Ocean Cafe. Celebrity Staff apologized for the mishap while patiently waiting in Ocean Cafe. It took 4 days for things to be worked out whereupon lunch service improved - took 4 days for a process to be defined which we strictly followed going forward. Fortunately, no further mishaps occurred requiring the need to speak with a ship&apos;s officer. Both Chef Raynold and Pastry Chef Sherin are excellent, especially preparing dairy-free meals and deserts. When ordering a specialty dinner package at Murano, upon going to Lawn Club to book a dinner for later in the sailing, it could not be found. Fortunately we were not charged extra. It was frustrating internal systems are not talking to each other or updating timely. Food on the boat was tasty for every meal eaten on board. While Blu offered light entrees at dinner, Aqua Spa Cafe offered light dishes at lunch. The salad and soba noodles were excellent! Sushi was great! It was a treat to experience Taj X one night at Sushi on 5. Since this was an Indian cuisine experience, Indian Beer should have been offered. Activities were posted in the daily itinerary and on a board at Guest Relations. Because each method draws its own audience, all daily items posted on the board at Guest Relations should have also been included in the daily agenda. As a participant, the LGBTQ social was moved two times without notice. This was confirmed because I took a photo as a reminder of the location (Martini Bar) and time the first day, only to see a different location (World Class Bar) when checking the board again. This was only discovered checking the board at Guest Relations at different times - not until Day 12 was the social published in the agenda. Posting all activities (for that day or daily occurrence) in the agenda all staterooms receive is best. On a related note, a small World Class Bar sign exists on the wall at the bar, but there is no World Class Bar listing on any board in hallways or outside an elevator bank(s). I had to ask Guest Relations two times for the location because I bypassed it for two days. We enjoyed activities offered on board (Nacho&apos;s dance classes in the morning, pool volleyball (guests vs. guests, guests vs. crew), Thriller dance class, Apple device classes/tutorials, cooking demonstrations). The Thriller dance class was fun to prepare for Halloween night. The foyer staircase and Ocean Cafe were decorated nicely and guests were encouraged to dress up. A costume parade would have been even better - start at Opus, walk to Reflection Theater, go down one floor, then end at Grand Foyer. DJ Gio played good tunes and mixes at the martini bar in the evenings and the bartenders at martini bar were animated making drinks, especially the evening of pouring several martinis from several shakers at one time. Some assistant/waiters in Blu were very attentive to us. The ship was elegant, clean, and well maintained. The glass elevators were very cool in the center portion of the ship. We spent a lot of time on the pool deck and in the solarium. I remember the Millenium&apos;s Solarium pool had metal bars in the pool for guests to sit/lean on - that was missing from this pool. The stateroom was always made up nicely by Wardan. He kept our quarters clean and tidy. He was attentive to our needs and personable when passing him in the hallway. Instead of Do Not Disturb signs, which easily fall off door handles, the rotating dial outside the stateroom telling the stateroom attendant service needed would have been better: Do Not Disturb, Make Up Cabin, Turn Down. A pleasant surprise was the light in the stateroom&apos;s bathroom did not fully turn off, but became a night-light. That was great - for those of us who get up in the middle of the night. The Captain was the best. He participated in the late night show Liar&apos;s Club. His daily morning announcements were hilarious and he met with guests while in public. Definitely a star! Went to Sky Lounge for Bandioke -- this was very clever and fortunately had a good turnout and guest singers. It was this night I attempted to order a Virgo drink from the lounge menu. The bartender told me the bar was out of some ingredients and could not make it. At World Class Bar another night, I ordered Strawberry Fields from this bar&apos;s menu. Bartender advised the drink is no longer made with egg white because of guest&apos;s intolerance, yet the menu clearly listed his ingredient, a reason I wanted to try this drink. For guests like us who did not purchase the drink package, Celebrity lost revenue. 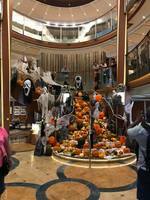 These mishaps deteriorate our experience on the Reflection and with Celebrity Cruises. We booked Aqua Class to experience light dining and hoped service level in the dining room would be more attentive. Consistently, this was not the case. It took 2 days for restaurant Maitre&apos;D and Assistant Maitre&apos;D to open up to us (they were so focused on the job and not guest experience) which left a bad first impression. Fortunately, as cruise went on, they became more personable and conversational. Staff were busy serving and clearing tables, but consistently we observed inefficiencies. At Blu and restaurants throughout the ship (Lawn Club, Tuscan), food would be delivered to our table correctly, but placed in front of the wrong person. This boat was understaffed (on 10/31/2018 at Ocean Cafe, took 20 minutes for tables at 2-3pm to be cleared by staff on the back deck, on 11/01/2018 while eating dinner at Tuscan service was very slow - had to request water glasses be filled twice and the wine order took 10 minutes to arrive at the table) and under-trained. We heard from guests and staff throughout the cruise, many staff were pulled off Reflection to prepare for Celebrity Edge - this showed and certainly contributed to our less than highly satisfied experience. Quality was not the same as prior Celebrity Cruise. As experienced mariners with NCL Cruises, we truly had high hopes for Celebrity to deliver in all areas. We have even stayed in NCL&apos;s Haven class (on mega-ships - MS Escape) and felt Celebrity&apos;s Aqua Class would offer equivalent food and service levels. Unfortunately that was not the case. Consistently, service performance on this Celebrity cruise under-performed. With Celebrity striving to provide the best vacation possible, it fell short. While the cruise was enjoyable, no positive changes were made in our lives as guests. Clean and tidy. Spacious for two. Took a segway tour of the city through Celebrity. Very fun! walking tour of small part of city through acting and singing - cannot remember name of excursion. unfortunately the weather did not hold up so it was rainy which limited our time outdoors. it was a very cute concept.